Koi are popular pets because they’re majestic, friendly and relaxing to watch. But not everyone has the resources to build their own koi pond. Luckily there’s another option. A koi fish aquarium can be a great option for koi parents looking to spruce up the inside of their homes or protect their koi from predators and the elements. An aquarium for koi fish is a bit different from a regular aquarium, so there are a few things you need to know before moving your koi into their new home. For adult fish, a safe stocking density is about one inch of fish per ten gallons of water. So if your koi is already ten inches, you’ll want a minimum tank capacity of 100 gallons. Smaller koi can be stocked a little more aggressively, but make sure to remove fish as they grow to maintain a good fish to water ratio. Your koi like to breath, so it is a good idea to invest in a reliable, high-quality pump to ensure good aeration. Your koi fish aquarium should have a dissolved oxygen level of at least seven parts per million at all times. Koi also like to eat a lot, which also means they produce a lot of waste. Purchasing a good external power filter or canister filter is essential. Without one, your water quality will be poor and your tank will be cloudy. Your filter should offer three-stage mechanical, chemical and biological filtration. To make your selection easier, most filters are rated for aquarium size, fish load and GPH (gallons-per-hour). Koi are like Michael Jordan with gills. 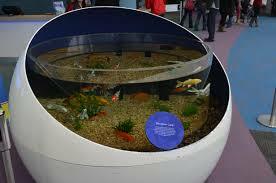 Make sure your tank has a safe roof or netted cover so you don’t find them on the floor. Keep your fish friends wet! Aside from investing in a quality oxygen pump and filter, you’ll need to perform regular water testing. Water testing should be performed at least once a week. Test more often if you want to be safe or if you’re making changes to your aquarium. A quality testing kit is essential for managing water parameters like pH, ammonia, nitrite and nitrate. Also make sure to perform regular water changes because nitrate reduction is needed in closed systems. There’s really no exact guideline for how often to change your water because it depends on a variety of factors. The amount of fish, type of equipment and nitrate reducing factors in your aquarium will determine your water changing frequency. Substrate (rocks and pebbles at the bottom) is an aquarium standard. You don’t necessarily need it but most aquarium owners use it because it looks cool and provides a habitat for beneficial microorganisms. Plus koi love it! Aquarium lighting will make it more enjoyable to view your fish and decorations. Lighting will also help the plant life in your tank grow, but try to keep your tank out of the sunlight because it will boost the growth of algae. Use an aquarium heater to maintain a constant temperature if your space gets cold or is prone to rapid temperature shifts. At the very least, a tank thermometer will provide some peace of mind. And finally, what fun is an aquarium without some decorations? Jazz it up! So you don’t have a koi pond. Who cares!?! Raising koi can be just as fun, rewarding and successful when you create an optimal environment in your own koi fish aquarium! Aug 31 Koi vs Goldfish: Why are They so Similar?